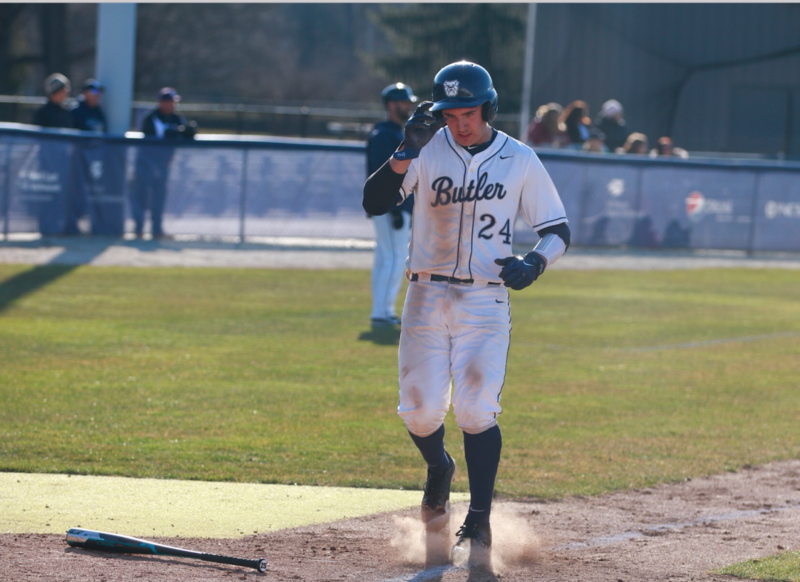 Duncan Hewitt taps home plate to score for Butler. The team is 1-1 after winning the first game against Creighton and dropping the second. Jimmy Lafakis/Colleigan file photo. After inclement cancelled the Big East opener between Creighton and Butler, the two teams agreed to play at Southern Illinois University Edwardsville. The Bulldogs split the weekend series, putting their overall record at 18-8. The score was 3-1 in the sixth inning until Harrison Freed delivered a game-tying two-RBI double to left field. The Bulldogs never looked back as they tacked on three more runs in the eighth before shutting down the Bluejays. Starter Connor Mitchell went five innings, allowing two earned runs. Sam Hubbe relieved him for an inning and two-thirds, giving up one earned run. Josh Walker was Butler’s pitcher of record as he received the win after finishing off the Bluejays. Freed and Garrett Christman both had productive days at the plate. Freed went 2-for-4 and brought home three Bulldogs. Christman led the teams in knocks as he went 3-for-4. Creighton struck first with a run in the opening inning, but the Bulldogs responded in the third inning with a run of their own. Zach Parker and Zach Jarosz had back-to-back singles to lead things off. Jacob Margroff laid down a bunt to advance the runners. Tyler Houston followed by grounding out and bringing home Butler’s first run. Michael Hartnagel and Christman later delivered in the eighth by singling. Freed followed up with a RBI single back up the box and into center field. Connor Dall advanced both Christman and Freed into scoring position with a sacrifice bunt. Christman reached home on a passed ball, advancing Freed to third. Zach Parker then took advantage of the mistake and singled, bringing Freed home. The Bulldogs fell 3-2 to the Blue Jays despite home runs from Tyler Houston and Michael Hartnagel. Houston had a field day as he went 3-for-3 with a RBI and a run scored while Hartnagel ended his day with a 2-for-3 display. Creighton struck first with a home run in the bottom half of the fourth. Houston responded with a solo-shot of his own to knot the contest up at one apiece. The Blue Jays answered with a run in the bottom of the fifth off a RBI single to take over. Hartnagel tied the game up with a homer in the sixth, but that’s all the offense the Bulldogs saw for the rest of the day. A RBI double down the right field line in the seventh sealed the game for Creighton. Garrett Christman got the nod, pitching just over six innings and striking out five. Butler will return to action on April 10 with a single game at Fort Wayne. Their next home game is April 11 against Morehead State.